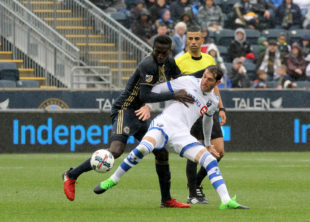 Philadelphia Union kicked off U.S. Open Cup play on Wednesday night, defeating USL side Harrisburg City Islanders 3-1 before a sparse crowd at Talen Energy Stadium. Jim Curtin put forward a less-than-full-strength side to face a lower division opponent, so full player ratings might not be useful. Rather, here’s a look at some of the players who helped their standing in the team with their performance — and some of the players who didn’t. Derrick Jones and Marcus Epps: Two Union rookies opened their Philadelphia accounts on Wednesday night, and both did so with placement over power. Jones’s first half goal curled into the far corner from 23 yards, a low shot that Sean Lewis had no chance of saving. Epps used his speed to get behind the Harrisburg defense, then feigned like he was going to pass the ball through the box as he bore down on goal. Instead, the winger chose to pass the ball into the net instead, finding a sliver of space around Lewis and inside the post. Both players performed well outside their goals, with Epps showing a willingness to invent on the wings and Jones gliding across the midfield as both destroyer and distributor. Jay Simpson: The English striker’s first MLS season has been uneven, with injury and C.J. Sapong’s torrid start keeping Simpson chained to the bench. In his limited minutes so far this season, Simpson’s passing has been his strongest attribute, even when his finishing has let him down. Taking advantage of a rare start, Simpson showed great awareness and some talent for hold-up play in notching two first-half assists. He probably should have scored when in on goal, too, but Lewis made a fine save to deny the striker his second goal of the season. With a potential national team call-up looming for Sapong, Jim Curtin should be comfortable turning to Simpson for a couple of starts. Giliano Wijnaldum: The Dutchman showed some of what he offers going forward with his second solid performance of the season. Wijnaldum doesn’t have Fabinho’s footspeed, and his passing isn’t always precise — one or two passes went completely wayward. But Wijnaldum does offer strong defense, a knack for making the intelligent run, and some smoothness on the ball under pressure. As the left back of the future, it seems likely that Wijnaldum will earn more starts in cup and league play as the 2017 campaign rolls on. Roland Alberg: Against a lower-division side, asked to do nothing but attack and pick out the right passes, Alberg failed to exert much influence on the game. Alberg’s instincts are to shoot first, shoot second, and pass third, which too often results in him missing Union runners in good positions. Alberg needs to offer some shooting to make up for his lack of distribution, which he failed to do — his free kick strike in the first half floated aimlessly over the crossbar, as my colleague Mike Servedio predicted just moments before he hit it. Based on their current fit and form, Ilsinho shouldn’t feel threatened by Alberg taking his minutes at the 10. Keegan Rosenberry: Something just isn’t clicking for the second-year defender right now. Rosenberry struggled in the passing game, didn’t get forward, and lost his mark on Harrisburg’s only goal. He also spent much of the match jawing with the referee — though, bizarrely, it seemed to be initiated by the official rather than Rosenberry. One good sign is that Rosenberry never stopped fighting, as he resorted to his physicality and tenacity to win balls even when his technical skills failed him. It might make sense to give Rosenberry some regular game time with Bethlehem so he can play his way out of this funk. I don’t understand how some people can call Simpson words like brutal. He has looked mostly fine, and in some cases last night he showed great touch in tight spaces. He seems comfortable in traffic. He had a couple of great feints too to get into space last night too. One I remember the most when a pretty way he received a long ball to get away from two defenders and into space. My only knock on Simpson is I wish he’d shoot the ball more. He was the striker, and at times seemed to be looking for a pass more than a shot. Otherwise I’d like to see more of him…. One player I thought was mediocre last night was Jack Elliott. I’m hoping it was because he was on the left rather than the right but I didn’t think he played up to par. He had a couple of loose moments agreed..
… but also played quickly from the back, outleted beautifully often in one touch volleys or with his head —-right to the feet of his teammate— and never attempted to Richie Marquez the ball down the field, as a matter of fact one time tried to play a lovely over the top left footed ball that was awry as I recall. Said before and will say again and don’t think I’ve poached from anyone — Keegan may be experiencing the first run of adversity in his entire footballing life. We will find out what his mettle is. Last night needed to be a close down statement from a young player against a weak opponent and too often sitting right there watching it live I thought, man this is a missed opportunity for the young man. Sloppy. Unfocused. Misappropriating attention. Foot on top of the ball slowing the game down instead of playing quick. Rough. Three really well taken goals from the boys. No other comments to make. I think its time to send Alberg out this transfer window. Between Alberg and Ilshino the Union have a pair of mercurial high upside/high downside players. I think we can only afford to have one and Ilshino offers more going forward. Alberg let a golden opportunity slip by last night. He’s fighting for minutes (well, maybe fight is too strong a word; perhaps he’s just longing for them) and, against a weaker opponent, showed no fire at all. He seemed disinterested for much of the game. Instead of taking charge, as a 10 should, he lollygagged around the pitch. Something is going on with him, something more than a “fitness issue” or “minor knock” that is keeping him off the pitch. I think that’s just who he is. A floating second striker who can be dangerous. He works best if you are a team that expects to be able to consistently distribute to your forwards and pressure the other team. I’d like to see more Epps. A winger tandem of Epps and Fafa could really cause problems for opposing defenses. That’s a whole lotta speed. +1. There are guesses that Arena will call in his second-choice squad for the Gold Cup. This could give CJ and Pontius a greater chance of making the squad. And now I feel absolutely fine about Epps on the wing for Pontius, if he sticks. Given the choice between Epps and Jones, I’d like to see more of Jones, which means moving Bedoya to the wing. Maybe I watched a different game. For me Simpson – and I used the word brutal earlier in another comment of mine – and maybe that harsh, but I just wasn’t impressed. Sure he made two simple, basic passes that CJ and Jones then finished but I feel like he was slow on a cross that should’ve been his… he shot wide/over the net a few times… and for the contract he has – and yes I get it, that’s not really any of his problem – get the most you can get – he did nothing to show me he should start. I notice you didn’t mention his touches or control, which I felt he showed off well a couple of times to get out of pressure and break into space. I have to agree with Wolfpack on this one. Yes he had two layoffs (on a very disorganized back line), but I was not impressed with the rest of his game. He gave up the ball fairly easily, and really doesn’t seem to have a nose for goal. CJ outshines him on every level. Keep him as a back-up? I guess, but for the money we can get better. With respect, the idea that CJ Sapong outshines him on every level is ludicrous. CJ has minimal skill on the ball let alone in tight spaces. Also, how do we know what his nose for goal is? He’s had very limited quality time on the field and hasn’t been on the field with ilsinho in the 10 even once– during a game when they weren’t chasing a goal late —throwing the entire team forward eschewing shape altogether…. and Alberg did nothing at all to help the striker last night to boot. I think those of us who judge Simpson harshly probably see his contributions to the team balanced against his salary and find him insanely overpaid. He’s a fair player with a nice touch but that’s about all. Against a lower-division squad, he should have been able to dominate and he clearly did not.